The EURAP registry is a dynamic system that is continuously updated. Online reporting of pregnancies from Reporting physicians to National coordinators and finally the Central registry is achieved with the use of a software program specifically developed for the project. 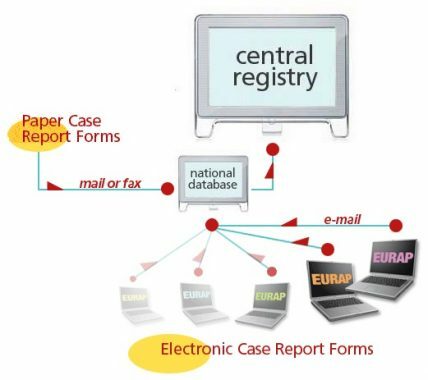 The key element of this system is represented by electronic Case Report Forms (CRFs) that facilitate data collection, storage and transmission via e-mail. A direct communication and intensive interaction is thus established between EURAP collaborators and the Central Registry. This translates into efficient enrolment and follow-up of cases on an international basis. In addition, the software allows Reporting physicians and National coordinators to build their own local and national databases. NOTE: Though we strongly encourage use of the EURAP software, data can also be collected using CRFs on paper. Once filled in, they need to be sent to the National coordinator or the Central Registry by mail or FAX.